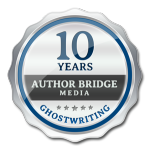 We're happy to offer 30-minute session to get an overview of your book goals and how we can assist you to reach them. This is a gift session from us ─ no cost to you. Congratulations on your Quiz result!